Hello all, the last thread on putting together an MJT Jaguar went so well that I have decided to create another on rebinding the Bound To Kill Us All jaguar by Andrewdoeshair. I have loved this guitar since its inception, and was lucky enough to buy the body a while back. Unfortunately when it arrived, the mail service left it on my front step in freezing temperatures, and the binding separated. Rather than reglue the pearloid and hope for the best, I decided to take on a rather extreme solution of rebinding an already finished guitar. This is different from many other threads I have seen on binding, as those usually contain bodies that are raw wood, awaiting paint. This is more of a restoration thread than a build thread. Before I start off, I would like to thank ADH for building this body, and Jarin at Guitar OR Calgary for helping me with this rather crazy project. Whenever I ran into an issue, he was there to help with some tips on how to make things work. I would also like to take the time to state that I am NOT a luthier, and the below steps are not the only way you can do this. This is the method I chose to take, it worked well for me, but if you have any other tips/advice that can help, feel free to add them. Sadly this guitar was left in this state for a while as I was out of work, and was quite apprehensive about messing up a guitar body that was basically irreplaceable as Andrew doesn�t build many guitars any more. By chance Jarin had a 1 inch strip of binding laying around his shop one day, and I decided to try it out. Luckily it was a VERY close fit to the stock route, so Jarin ordered up a strip of binding from allparts that matched the spec, and the journey began. 2. Prepare for binding, this may take some time, but the more time you take here, the more prepared you will be for anything that comes up when glue is drying. 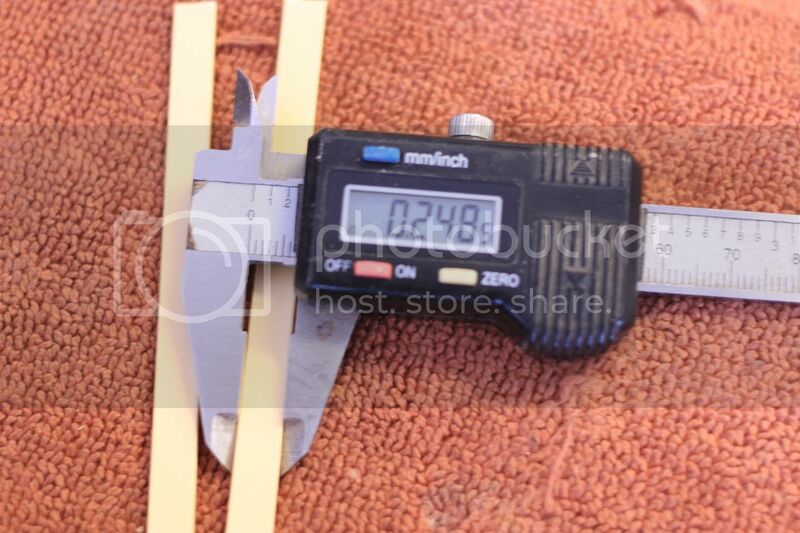 Pre-tear all your tape strips, have the contact cement ready, measure-measure-measure, etc. 3. Prebend the binding by using a heat gun to gently bend the plastic. The trick is to not get the gun too close, and just getting the really sharp angles sorted out. 4. Sand the binding surface that will contact the guitar (I used 240 grit) on the entire length of the binding, and clean both the surface of the guitar AND binding with alcohol. 5. Now comes the tricky part, the binding needs to be secured to the body. I chose quick dry cement based on Jarin�s recommendation, and it worked great. It does set quite quickly, so it is important to be prepared, and work in 1-2 inch increments. I used small dowels to apply the cement, were I to do it again, I would use flat toothpicks to work more material between the body and binding. I started on the sharpest corner first, I like to get the difficult things out of the way, and wanted to pay the most attention on this. Apply a dab of cement to the body, secure the binding, apply tape, repeat. Note, this material WILL DISOLVE NITRO if left on, so proper masking of the body and wiping away excess quickly is KEY. 6. I left the tape on for 48 hours, it probably could be left for less but that is how my schedule worked out. Start removing the tape that was used to secure the binding, and make sure the binding has stayed in place. If the binding has not stayed secure, you can resecure, retape, etc. LEAVE THE GREEN TAPE YOU SEE IN THE PICTURES ON! 7. Once the binding is secure, there will still be areas where the binding is higher than the body, this is where the DANGEROUS part of the job comes in. To remove excess material, razor blades will ensure the binding matches with the body height, and stays level. When you start, do this with the Pay lots of attention here, it is easy to gouge your guitar body, or fingers (yes, I have a bandaid for the next couple days). The tape around the binding is left in place while you take down the majority of the material to save the finish. Long strokes will get lots of material off, keep some of the excess material around. 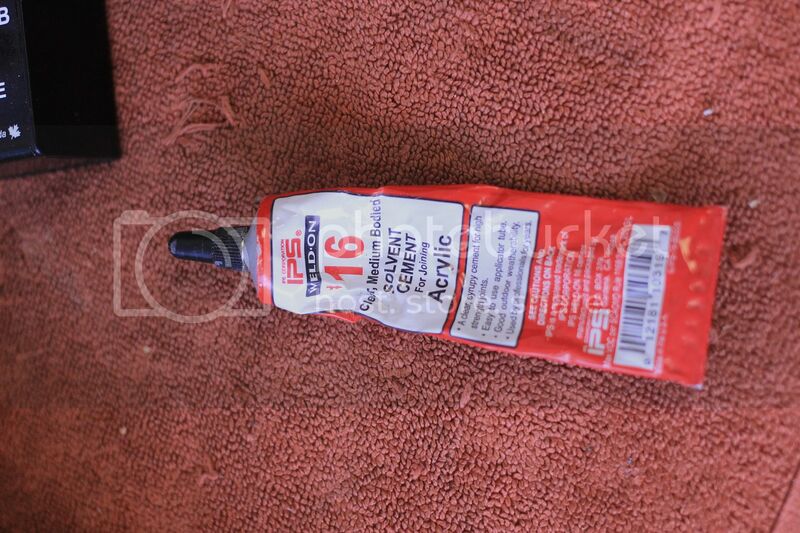 Once you have removed most of the excess, sand paper can be used to remove chatter marks, sharp edges, etc. IF your binding has separated anywhere, you can dissolve some of the excess material in solvent, and fill the gaps. 8. At this point I pulled all the tape from the body, and took care of any detail areas with the razor and sand paper. This is the point where you want to sweat the details and get out all the scratches/anomalies. This is an area where it is VERY easy to mess up and hit the finish, so take it slow. I also slightly contoured the corner of the binding to decrease the chances of finish not bonding, you can decide if this is right for you, or you need a 90 degree angle on binding. 9. Retape the WHOLE body, exposing the binding as previously done in step 1. To clean the surface of the binding from any grease, dust, etc. I used lighter fluid. 10. Jarin had clear nitro available in a handy CO2 powered sprayer, but rattle cans will work too if you need it. 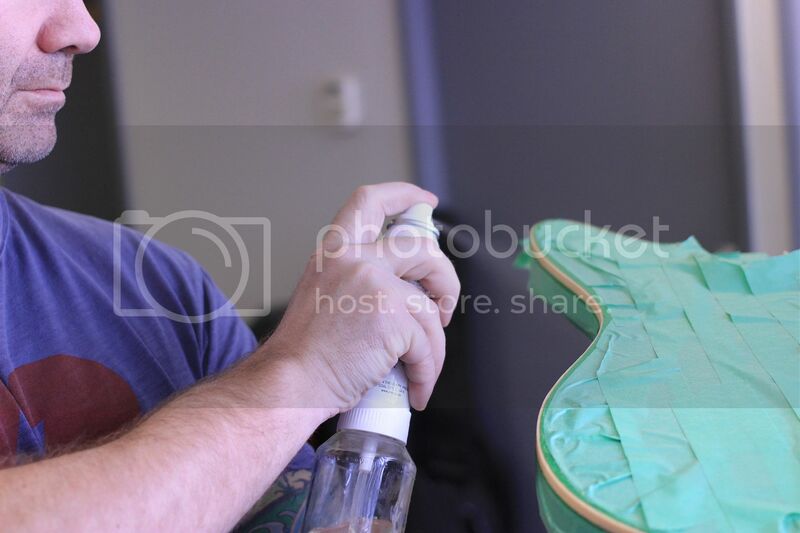 Here you can see him spraying the binding, follow the contours of the guitar, stay between 6-12 inches, and keep long, even strokes. We did about 5-7 layers on this binding, as we didn�t want a lot of build up that would make it higher than the body again. Again, this is all preference, and I can afford some thinner nitro on the binding myself, as the body is already somewhat aged. 11. Unfortunately you now have to let the nitro set for 2-4 weeks. I went with the shorter time frame as it is thinner finish on plastic, and Calgary is INSANELY dry. Test the nitro hardness, when you are comfortable you can polish it. MANY articles have been posted on making sure nitro is cured, and how to polish, I have done it by hand and using a machine, either works well, it depends how much control you want.